The online TV leader is investing in original content to capitalize on its long-term growth opportunities. Netflix (NASDAQ:NFLX) is burning massive amounts of cash, and it will probably keep generating negative cash flow over the coming quarters. This situation can be a reason for concern among investors in the company. However, management is implementing the right strategy, both from a financial and strategic perspective. Let's take a closer look. Netflix is increasingly betting on original productions as opposed to licensed content. The company is launching 600 hours of original content in 2016, and it's planning to increase that number to 1,000 hours in 2017. According to management, Netflix is aiming for 50% of its library to be original content over the long term. This strategy has significant advantages for Netflix, but it's also taking a heavy toll on the company's cash flow. Netflix reported a negative free cash flow of $506 million during the third quarter of 2016, a significant deterioration from a negative $254 million in the second quarter of the year, and also a decline from a negative $252 million in the third quarter of 2016. 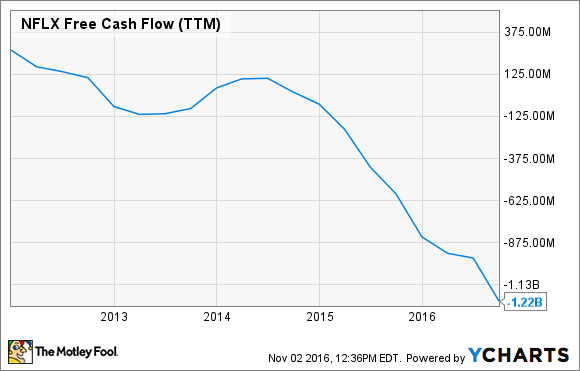 Looking at free cash flow evolution over the past five years, the picture doesn't look very pretty at all. The company expects to continue burning cash over the mid-term. Management believes the business is on track to generate "material global profits" in 2017, but accounting earnings and cold, hard cash can be remarkably different things. For the fourth quarter of 2016, the company expects free cash flow to come in at similar levels to those of the third quarter of the year, and management has indicated that free cash flow will remain under pressure over the coming years. Netflix has enjoyed spectacular growth over time, but content can be dauntingly expensive, and the fact that the business will continue burning cash over the coming years is an important risk factor to keep in mind. Free cash flow is one of the most important metrics to consider when analyzing investment decisions, and investors would be wise to watch Netflix's cash generation like a hawk going forward. However, financial metrics should also be analyzed in their proper business context. Original content demands lots of upfront cash from Netflix, but management believes that betting on original productions is ultimately more profitable over time than relying heavily on licensed content. Perhaps even more important, original productions attract more customers to the service, and it also differentiates Netflix from other industry players in online TV. The increase in our free cash flow deficit reflects the growth of original content, which we are increasingly producing and owning (rather than licensing). Self-produced shows like Stranger Things require more cash upfront as we incur spending during the creation of each show prior to its completion and release. In comparison, we generally pay on delivery for licensed originals like Orange Is the New Black, and we pay over the term of the agreement for licensed non-originals (e.g., Scandal). Over the long run, we believe self-producing is less expensive (including cost of capital) than licensing a series or film, as we work directly with the creative community and eliminate additional overhead and fees. In addition, we own the underlying intellectual property, providing us with global rights and more business and creative control. Combined with the success of our portfolio of originals and the positive impact on our member and revenue growth, we believe this is a wise investment that creates long-term value. Consequently, we plan on investing more, which will continue to weigh on free cash flow. Netflix ended the third quarter of 2016 with 86.7 million streaming members globally, ahead of the 85.5 million subscribers management was anticipating for the quarter. The company believes that this higher-than-anticipated growth was driven by strong demand for original content, including Stranger Things and the second season of Narcos. Netflix is at the forefront of the online TV revolution, and it has tremendous room for expansion over the years ahead. With this in mind, it makes sense for the company to invest plenty of cash to capitalize on such massive opportunity. Original content is a key growth driver for the business, and it's also the right strategy when considering the financial costs and benefits over the long term. Netflix will probably keep burning cash going forward, but it will do it for smart reasons.